As a Factory Authorized Distributor of products and training for Elite Crete System, the purpose of this website is to provide regional information for our customers and future clients in Alabama, Tennessee, Mississippi, Arkansas, Oklahoma and other surrounding states. Whatever you need, please feel free to browse our website and various links and then contact us if we can be of assistance and answer any questions you might have. The Elite Crete Systems history, experience and roots in the decorative and restoration cementitious overlay industry is deeper than any other company or product line today. "Elite Crete" products were originally created as simply a "Product Brand" and at the time only sold cementitious overlay materials to other decorative and restoration type companies under private label or re-label. Later, the decision was made to create and launch an entire branded company and material line called "Elite Crete Systems". Today, Elite Crete Systems has training and technical offices in the following North American regions: Indiana, Louisiana, Eastern & Western Canada, Minnesota, Northern & Southern Ohio, Northern & Southern California, Kansas, Michigan, Oregon, Massachusetts, North Carolina, Texas, Illinois, Arkansas, Florida, Utah. In addition to our domestic locations, we have training and technical offices in Norway, Australia, Africa and Israel. 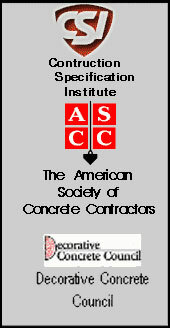 We not only set the initial and current standards for decorative & architectural concrete finishes, thin stamped concrete overlays, staining concrete overlays, decorative concrete resurfacing, stained concrete floors & finishes, concrete resurfacing restoration, decorative concrete sealers, polymer modified concrete overlay systems, clear & pigmented epoxy coatings & concrete overlay products in general but we are constantly raising the bar as well. From our highly sought after training seminars, to the detailed engineering of our entire product line designed with the contractor in mind, to our commitment and dedication to a level of customer service and technical assistance is second to none in this industry. We use words like "Quality, Ease of Use and Innovative" to best describe the basis of every product we manufacture. In fact, our company mission is to provide the most comprehensive architectural concrete overlay system available, one that is of the highest quality, easy to use, with substantial versatility and yet reasonably priced. We manufacture one of the most complete lines in the industry and are committed to quality customer service and technical assistance. We are fully dedicated to our customers and provide them with personalized, quality service and attention. Today, Elite Crete Systems is the leading manufacturer of concrete overlay systems and is widely regarded as the "Architectural Concrete Overlay" industry's leading innovator, manufacturer and supplier with our products specified and successfully installed on thousands of projects every year.